The Master of Science in Computer Science is designed for individuals with a B.S. in Computer Science who are looking to expand their knowledge and opportunities. Students with a bachelor's degree in another discipline may also apply for the M.S. in Computer Science after meeting certain eligibility criteria. Rowan features small class sizes where students do not have to compete for faculty attention. The M.S. in Computer Science degree can be completed as a full-time or part-time student. Most classes are offered in the evening to enable students to complete their degree while working. Many companies have tuition reimbursement programs that provide for the M.S. or one of the Certificate of Graduate Studies programs. Would you like to apply for the M.S. degree? The Masters of Computer Science is administered by the Global Learning & Partnerships of Rowan University (GLP). a minimum undergraduate cumulative GPA of 3.0 (on a 4.0 scale). Submission of official GRE test results is highly recommended. How does this program prepare its graduates? Graduates of the M.S. 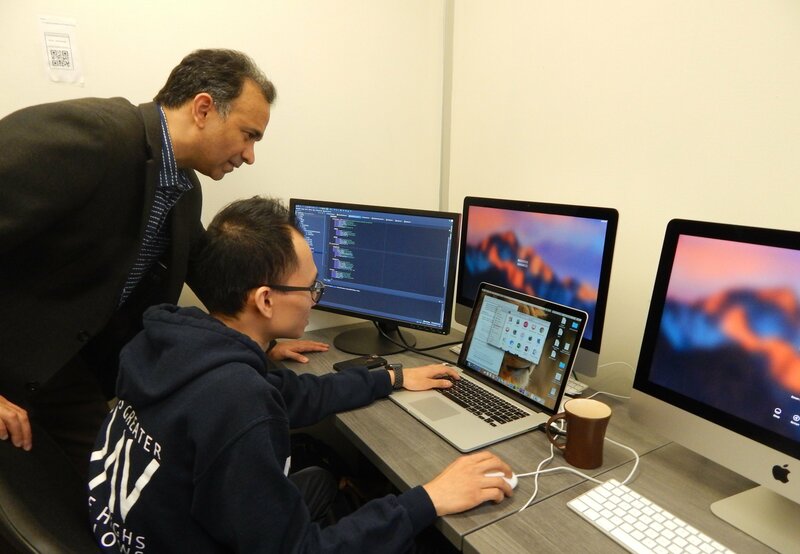 in Computer Science program have the skills and knowledge they need to excel in a variety of cutting edge technological fields. Current trends in education, industry, research, business and government show employers actively seeking individuals with competitive Computer Science skills that enable companies to stay abreast of the newest technology. M.S. in C.S. students complete a 30 credit-hour program - choosing a track with or without a thesis - to complete training in a program that will prepare them for a competitive and in-demand field.